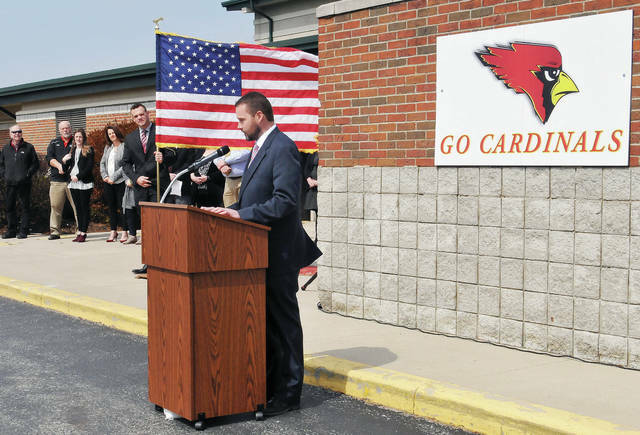 New Bremen Local School District Superintendent Jason Schrader speaks during the ground breaking ceremony for a New Bremen Elementary School next to the current New Bremen High School Thursday, March 28. 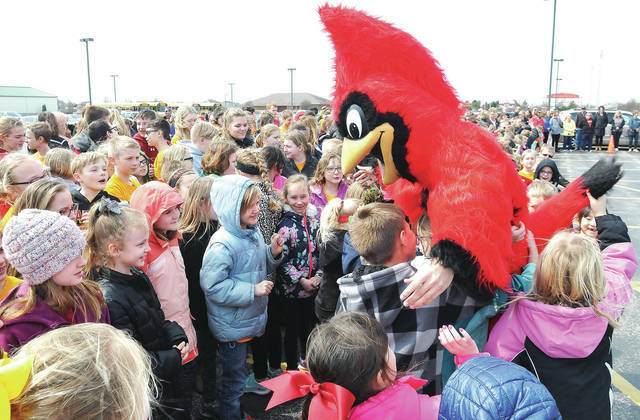 The New Bremen Cardinals mascot kept students entertained while they waited for the groundbreaking ceremony of a New Bremen Elementary School to start Thursday, March 28.The new building will be located next to the current New Bremen High School. Lilly Homan, left, 9, daughter of Ron and Kim Homan, and Will Reinhart, 9, both of New Bremen, son of Pam and Pete Reinhart, help break ground on a New Bremen Elementary School next to the current New Bremen High School Thursday, March 28. 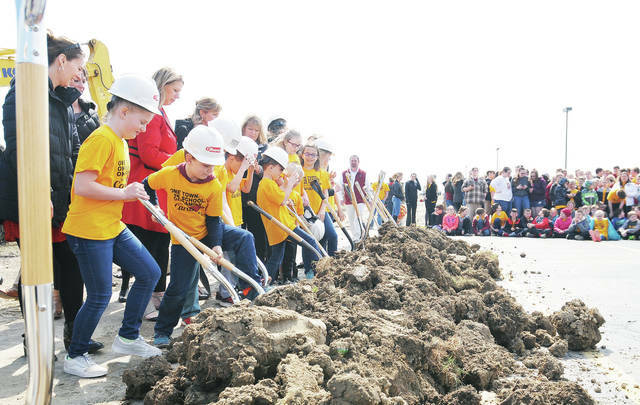 NEW BREMEN – Thursday’s groundbreaking for the new $17 million New Bremen Elementary and Middle School was celebrated by many dignitaries as well as the entire 750 K-12 student body. Superintendent Jason Schrader told the audience that this was a historic moment for the K-6 student body. He thanked members of the Board of Education, Cardinal Levy Campaign, Garmann Miller Architects, the Gilbain Company well as the village’s administration for helping create a state of art education center. Schrader said the three main subcontractors hired by Gilbain so far include Charles Construction Services of Findlay, Ohio, for the foundation, slab, and masonry work, Slagle Mechanical of Sidney for the HVAC work, and Sollmann Electric Company of Sidney for electrical and fire alarm installation. He added while they are sill on budget, they are still in negotiation with a couple of subcontracters. Schrader described how the students would be divided into pods for K-2, 3-4, and 5-6, all housed in a new building with state of the art security systems. The new elementary will be connected to the southeast corner of the existing high school. John Wells the head of the Bond Levy Committee said he learned a lot during the process of getting the levy approved. But, he said, it was the desire for quality education that drove himself and the other members of the committee to listen to all concerns of citizens. Shelley Bussee, president of the Board of Education, told the students they were experiencing history and to remember it took tenacity and hard work to make this all possible. Mayor Jeff Pape said the village wants to have new families and businesses settle in New Bremen and that a good educational system with modern facilities goes a long way into convincing people to come to live in the village. Pape also told students he was a life-long resident of New Bremen, and he remembers the old elementary with its hot rooms and creaky floors. He said moving to the new building would offer new opportunities to become the next leaders in their community. K-6 principal Diane Kramer said the new building’s Komminsk Center would be a school in a school, with both academic and hands on learning. The center was made possible by a $1,00,000 donation by Dianne Komminsk. Kramer added that since the construction attaches to the current high school, the complex will become a hug of the community. Construction is expected to be completed by the beginning of the 2020-21 school year.